If our website comments and email inboxes are any indication, among the least-popular changes in Lion (OS X 10.7) were those performed on iCal and Address Book. From their unnecessarily skeuomorphic interfaces to their omission of features available in Snow Leopard, these two apps have, in many a user’s mind, earned the criticism they’ve received. Which explains why many Mac users will welcome the updated versions of iCal and Address Book—now called Calendar and Contacts, respectively, for consistency across all of Apple’s computing devices—provided in Mountain Lion. While they don’t fix all issues present in their Lion counterparts, each offers a number of significant improvements. Here’s a quick look. While many iOS users will welcome Contacts based on the name change alone—especially if, like us, you often attempt to launch your address book in Spotlight by typing contacts—the biggest improvement to the app is the return of the three-column layout. Gone is the need to click a virtual bookmark to ever-so-slowly turn virtual pages; instead, you can choose from three display modes: card (single column); card and contacts (two columns); or card, contacts, and groups (three columns). 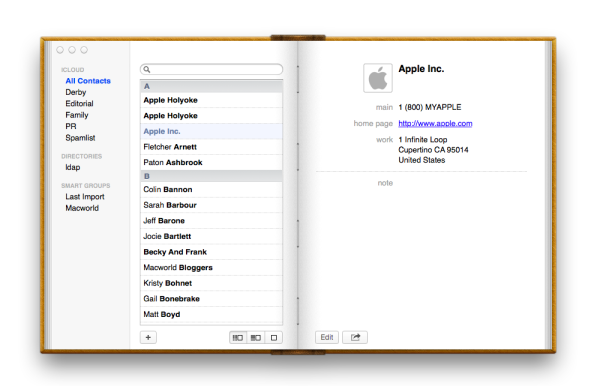 To retain the app’s book-like design, the three-pane view narrows your contacts list, allowing the Groups sidebar to sit on the far left of the page. 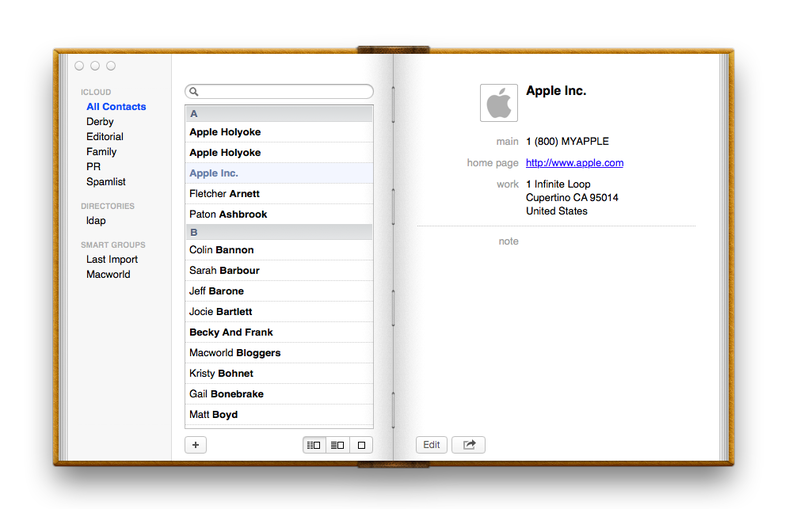 Contacts additionally sports Mountain Lion’s new Share button at the bottom of each card; you can export that card (in .vcf format) as an email or iMessage attachment, or via AirDrop. Two of the changes to Calendar in Mountain Lion will be immediately obvious. On the aesthetics side, Apple has gotten rid of the gaudy faux stitching. The program’s interface still tries a bit too hard to look like a physical desk calendar, but the new look is a bit more subtle. The bigger change—and the one that will likely be the most welcome by iCal’s critics—is that Calendars in Mountain Lion brings back the dedicated calendars sidebar. Instead of requiring you to click a button to view your list of calendars, Calendars provides that list, organized by calendar type, in a Snow Leopard-style sidebar on the left-hand side. Below that list is a mini calendar view that, by default, displays the current month and the upcoming month (though you can drag the calendar divider up or down to increase or decrease, respectively, the number of visible months). One small—but welcome—change is the addition of Apple’s OS X search tokens (which debuted in the Finder and Mail with Lion) for Calendar’s events search. 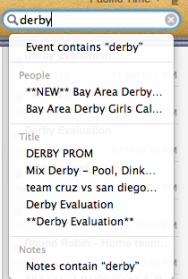 Instead of having to detail what kind of information you’re looking for off the bat, Calendar intelligently tries to suggest categories while you type; categories can include organizers, event titles, and notes associated with an event. Just like with Finder or Mail searches, you can stack categories: For instance, you could search for any events organized by “Macworld” with the name “meeting.” Search results have also been redesigned, appearing instead in an abbreviated form along the right-hand side of the app. 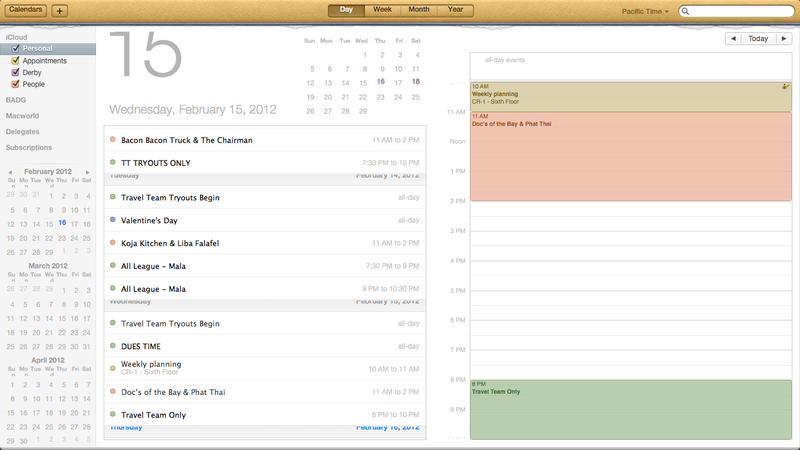 Mountain Lion brings contextual search and tokens to the Calendar app. To display those results, Calendar excises the reminders sidebar; as Mountain Lion includes a dedicated Reminders app, you’re expected to manage tasks and reminders from within that program, instead. Of course, this also means that if you want to create any sort of to-do, you need to hop over to Reminders to do so; unlike with Contacts, there’s no direct link to the Reminders app in Calendar. The other major change in Calendars is that Apple has completely revamped alerts and event reminders. For each of your accounts, you can now customize your default alerts, individually, for timed events, all-day events, and even birthdays; each of these can be set to occur a chosen number of minutes, hours, or days before the event. You’ll also find a few minor interface changes. For example, the Calendar menu is gone, with its commands redistributed among the File, View, and Edit menus. And you can now disable the “heat map” display for Year view.